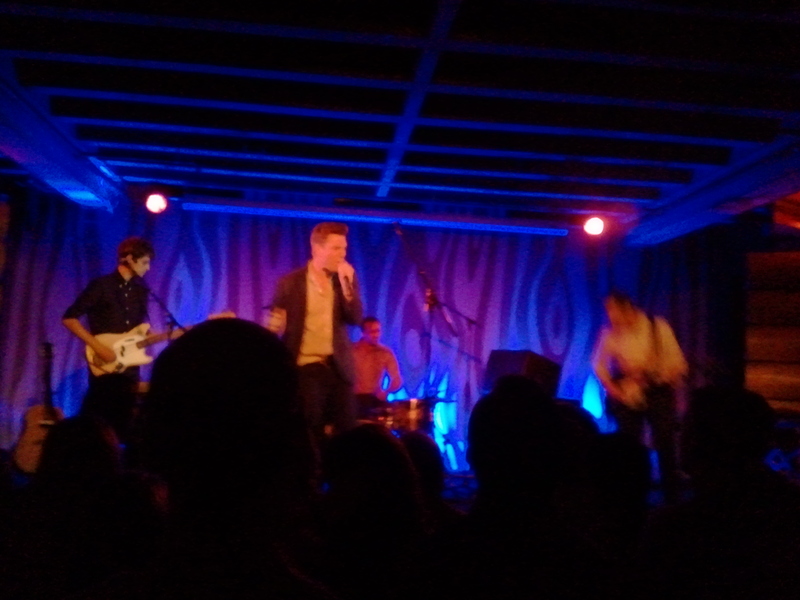 Before heading out on Monday night to the Doug Fir, I thought of a night about ten years ago when I saw The Walkmen perform at the same venue. To this day, it remains one of my favorite concert memories, as the band tore through a blistering set with such power that it felt like the lounge was ten times bigger than its actual size. Hamilton would also recall that night fondly, mentioning a couple of times during the set that he remembered having a great time ten years ago. It turns out we were both a little off in remembering the date (ten years ago I would not have been allowed into the venue–the show actually took place in the fall of 2007), but the performance Monday night was just as brilliant. Hamilton proved once again that the Doug Fir is the best place to catch a show in all of Portland–it’s an intimate space where you can get up close and personal with the artist (there’s not a bad sightline anywhere), and the sound is always fantastic. There’s never an issue with the mix, and each musical part can be heard with complete clarity–a quality you wouldn’t expect from such a small venue. Though Hamilton employed a wide range of musicians and instruments on Black Hours, he kept it simple with his live setup–a quartet which featured fellow Walkmen bandmate Paul Maroon on guitar and xylophone, with a bassist and a spare drumset (reminiscent of the type of kit that Matt Barrick favored) filling out the support. Even with the modest setup, Hamilton and crew captured the sounds of the album and thrilled the crowd. Hamilton enthralled the crowd from the beginning, kicking things off with the passionate “I Don’t Need Anyone”. He didn’t hold anything back, as he grabbed the microphone and leaned into the crowd to hit all the high notes with the loudest volume possible, testing the limits of the sound system. Leithauser seemed to be rejuvenated as a solo artist, eager to fight his way back up through the ranks and prove his talents once again; he had more energy than I had seen in years. Hamilton had control of the crowd before he hit the first chorus. Black Hours was already one of our favorite albums of the year, and it sounds just as great live, with Hamilton and the band bringing a thunderous energy to the music. The performance had the added bonus of allowing the audience to see how the different songs and their particular arrangements would capture distinct aspects of Hamilton’s personality. When Hamilton was just on vocals, it was a more lovelorn, bitter mood and it seemed as if he was baring his soul; when he picked up his acoustic guitar, like with the lead single “Alexandria”, the songs were more uplifting and he added a bit of swagger (with some stage moves that recalled a bit of Elvis, especially with some of the subtle hip thrusts); and finally, Hamilton with an electric guitar signified a more reflective spirit, with an air of contentment. The variation provided an excellent ebb and flow to the show, which differed from the normal straight run-through of the album. It also helped that Leithauser included a couple of the bonus tracks from the deluxe edition of the album–a passionate “I’ll Never Love Again” in particular convinced my friend that he needed to purchase the special edition vinyl as quickly as possible. It was a fantastic performance, and we were talking about the shows for hours afterward. We had a little bit of fun at the end, as I took a photo for a fan with him and Hamilton, and I hope that he enjoyed the goofy face that Hamilton provided. It was a neat little detail that capped off one of the best shows of the year. 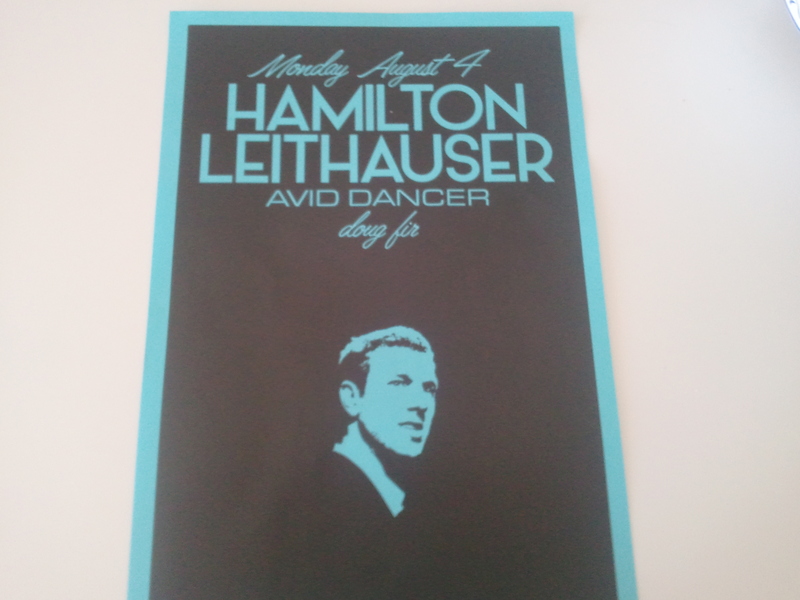 In a week filled with great new releases, it’s Hamilton Leithauser’s Black Hours that outshines them all. The debut album from the former frontman of The Walkmen masters the tricky conundrum that plagues every artist that goes solo: satisfying old fans while justifying the decision to go solo. Hamilton indulges enough touches and signifiers that recall the unique sound of The Walkmen, while experimenting with new ideas and leaving enough of his own personal imprint that makes Black Hours a work distinct enough from his previous output. Hamilton’s voice is one of the most recognizable in indie rock, and the full range of his rough-around-the-edges style is showcased throughout Black Hours. He switches effortlessly between an exuberant bark (“Alexandra”), to a joyful serenade (“11 O’clock Friday Night”), to a delicate croon (“St. Mary’s County”), and that’s within the space of three songs. The performance on Black Hours is reminiscent of the more recent Walkmen albums, where Hamilton learned to use the right amount of restraint with his voice, and not let its power get out of control. That said, he can still let it out when he needs to, as he does on the exhilarating “Alexandra”. Listeners should be able to pick out specific instrumental touches throughout Black Hours that evoke the trademark work of The Walkmen. Most notably, there is the clean, trebly guitar that appears in songs like “I Don’t Need Anyone” and “Bless Your Heart”, so it should be no surprise that it’s former bandmate Paul Maroon that helps out with guitar, strings, piano, and organ on eight of the ten tracks. There are other small callbacks that should grab the attention of Walkmen fans, most notably a chorus form “11 O’clock Friday Night” of “You and me and everybody else” that seems designed to specifically evoke one of their best-received albums. Even with all these details that hearken back to his previous band, Hamilton does enough to separate Black Hours from his previous work. “5 Am” is a spare, haunting ballad that would fit nicely in Leonard Cohen’s back catalog, and “The Silent Orchestra” continues with that retro-ish feel with the use of a playful backing orchestra, a style befitting that of a classic Dean Martin or Sinatra record. There’s the goofy marimba from “11 O’Clock Friday Night”, which sets the tone with a melody that rips off the old “Updated Score” sound from ESPN’s BottomLine ticker, and is soon matched by a prominent bass and embellished by the guitar. The careful use of strings throughout the album add a new dimension to many of the songs, but most effectively on “Self-Pity”. In the end, Hamilton doesn’t fully escape the identity of his old band; album closer “The Smallest Splinter” would fit perfectly within the tracklist for Heaven, and the careful, midtempo ballad is one of the highlights of the album. But that’s okay–when you were a member of one of the best indie rock bands of the past decade, no one should complain that the new music sounds a little bit like the old stuff.